In regards to the stocks' recent performance, Amazon (AMZN - Get Report) is not the stable ship that Apple (AAPL - Get Report) has been. The former is like a nice yacht caught in an ocean's fury, while the latter is like an aircraft carrier navigating a storm. Apple has largely held up amid the violent decline in the Nasdaq this month. Meanwhile, Amazon was strong enough to resist the urge of testing its 200-day moving average in the first half of the month, its strength eventually weakened. After a near-7% one-day rally into the print, shares fell by that much and more on Friday, the first regular-hours trading session since the report. On Monday it was gashed for another 7%, leading some investors to wonder when this name is going to bottom. It's also led many to ask themselves, "should I buy Amazon?" It's a stock that many investors have scoffed at for years, purely due to its valuation. And while it's been ignored for its valuation, Amazon has built out businesses that rival some of the largest in multiple industries. For instance, not only does it have a robust e-commerce platform disrupting the entire retail industry, but it has a massive cash-flow generator with its Prime membership. Its cloud business is a market-share leader, even among names like Microsoft (MSFT - Get Report) and Alphabet (GOOGL - Get Report) (GOOG - Get Report) . Google may be extra salty with Amazon, given the latter's now-sizable advertising unit as well. Those are just the plays that have worked out thus far. Don't forget about Amazon barging into the smart home with A.I.-powered smart speakers and TVs, security cameras and doorbells. Its entrance into the physical retail industry via its Whole Foods acquisition threatens to steal market share from countless grocery chains. It really says something about Amazon and how successful it has navigated over the past two decades when the biggest concern becomes regulation. Both companies have built out solid, strong, deep-moated profitable businesses with strong cash flow generation and are seeing their efforts pay off it new high-growth, high-margin businesses. For Apple it's Services, which is nearing $10 billion in quarterly sales. At a $40 billion annual run rate, we would be talking about this as a standalone company more often if it wasn't tucked away on Apple's income statement. Amazon is in a similar situation with its Prime/e-commerce combo as it builds out Amazon Web Services, advertising and other units. Investors ignored this potential as Amazon chose to invest in future growth channels rather than line investors' pockets with dividends. But now those investments are paying off. Amazon is expected to generated $19.50 in earnings per share this year, but keep in mind that over the past two quarters Amazon has just about doubled expectations. So the 2018 estimate could very well be too low, as could the 2019 estimate calling for $26.77 in earnings per share. While it's hard to make the case that Amazon is cheap at 76 times earnings, consider that it will have more than 400% earnings growth this year should it achieve that $19.50 per-share figure. On traditional metrics, Amazon is far from cheap, but since when is Amazon a traditional company? We shouldn't compare Amazon to 3M (MMM - Get Report) , Union Pacific (UNP - Get Report) or other traditional names purely because it isn't a traditional company! While traditional investors may not like to hear it, Amazon is becoming more and more reasonably valued as time goes on. As its other businesses continue to grow, I suspect that will remain the case. Long-term investors who have time on their side may be wise to scoop up some Amazon while they can. That brings us to the charts. Amazon, Apple, Microsoft, Alphabet and 3M are holdings in Jim Cramer's Action Alerts PLUS member club. Want to be alerted before Jim Cramer buys or sells AMZN, MSFT, GOOGL or MMM? Learn more now. The breakdown has been ugly, no doubt. 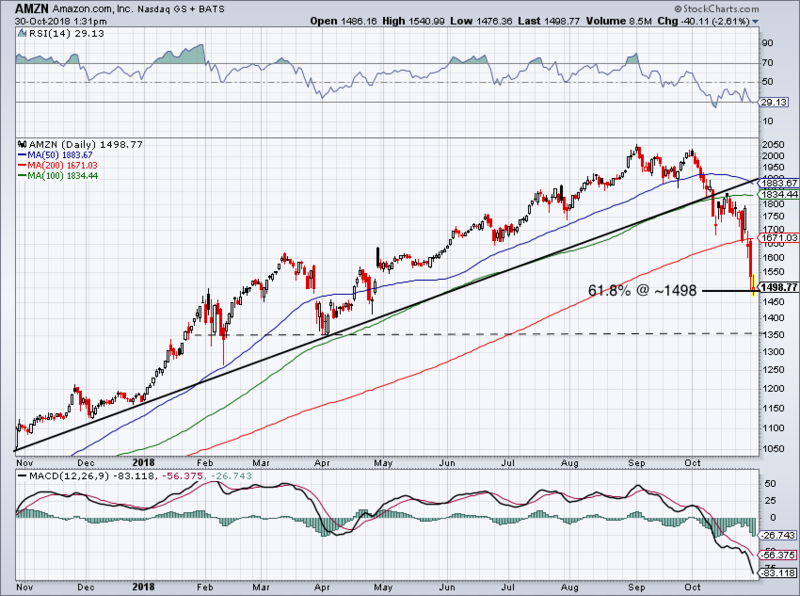 It would be very discouraging to see Amazon stock retest and fail at the 200-day moving average. That's probably one of the bulls' biggest fears right now. Near $1,500 is the year-to-date 61.8% Fibonacci retracement and it would be positive to see this level hold as support. Any more significant weakness could push Amazon down toward the first-quarter lows near $1,350, but now down more than 25% and buyers should seemingly start to defend one of their favorite names relatively soon.